Quarterback Dak Prescott was given a warning by the NFL after he was dropped into the kettle by Elliott after a touchdown run later in the win against the Redskins. As a rookie in 2016, Elliott was not fined for jumping into the kettle following a touchdown. 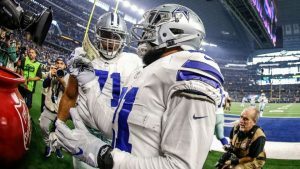 After the game, Elliott and Prescott pledged $21,000 donations to the Salvation Army, which the Cowboys have matched. Elliott was also asked what advice he would give to Reuben Foster and Kareem Hunt as they face sanctions from the NFL for accusations of violence against woman.